We are in the brightly lit offices of Flights of Fantasy Headquarters. Behind a mahogany desk that’s covered with Star Wars models and molded Lord of the Rings miniatures sits CHRIS T. BOSSMAN, head of new products. There’s a KNOCK ON THE DOOR and Chris looks up from his work. The door swings open and ELIZABETH HARGRAVE, game designer, enters. Chris gestures to a chair and she takes a seat. Chris sits up in his chair, confused. Chris flaps his arms, miming wings. Elizabeth nods. There’s a long, uncomfortable pause. Chris looks down at the desk, then up at Elizabeth, then back down at the desk. There’s a pause. Elizabeth tries again in an encouraging tone. Elizabeth looks at Chris. There’s a long pause. I don’t think any tabletop story has delighted me more, this year, than the developing success of Stonemaier Games’ new title Wingspan. 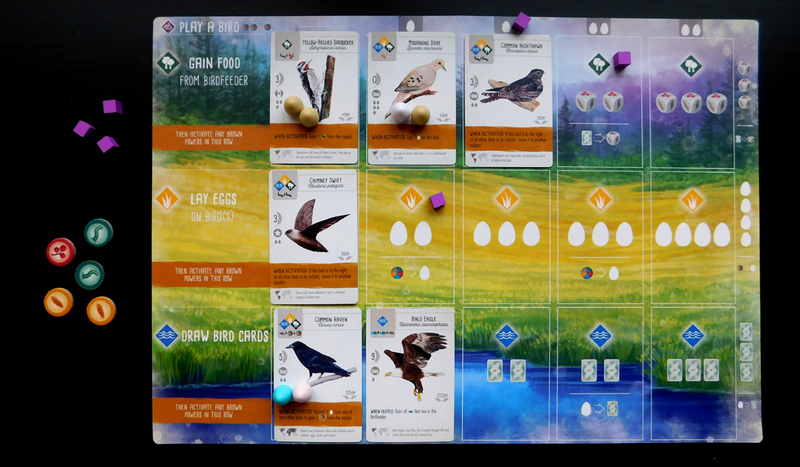 Offered as a pre-release direct from the company early this year, and then thousands more copies hitting shelves (and immediately selling out) for a print run in March, the demand for this logic-defying game of bird-feeding and egg-laying has defied any and all expectations, even from the publisher! Stonemaier proprietor Jamey Stegmaier already has third and fourth print runs scheduled, and the original supply was snapped up so quickly that it prompted this blog post in response to a disappointed and vocal group of fans who were unable to get their store per-orders. In an era where games come and go in a matter of weeks without making an impression, somehow this ornithology-themed engine-builder has sold out 10,000 copies without making a dent in the demand. So how did they do it? I don’t usually like to start with the publishers but it’s impossible not to with this cornucopia of linen-finished cards, pastel egg minis, and overall lavish design work. 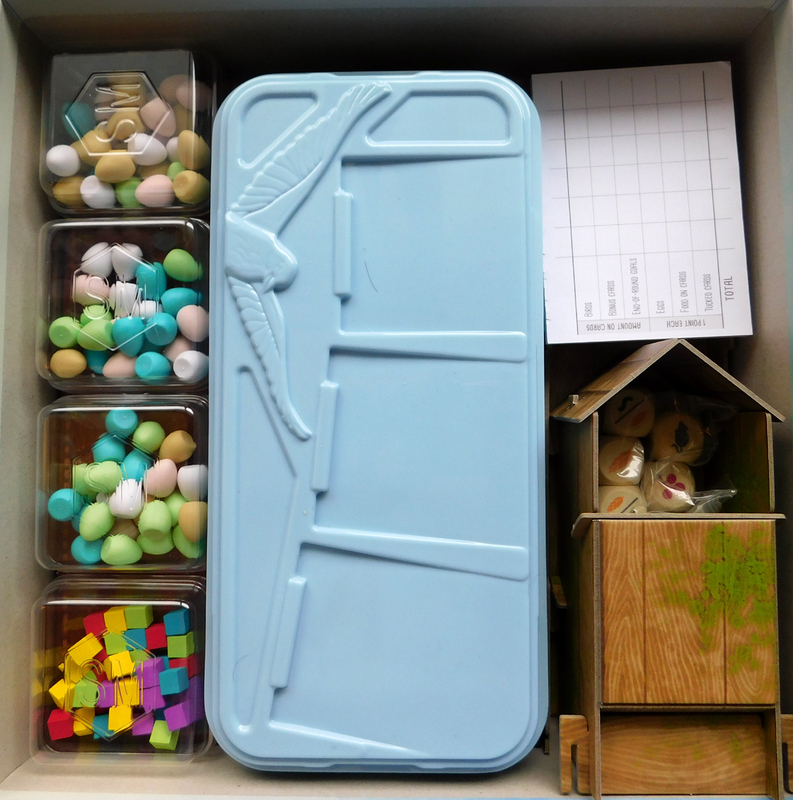 While some games arrive without so much as a plastic bag to store components in, Wingspan contains dedicated molded containers and a clever card-holder that doubles as a key part of the game when the deck is in play. Even the manual itself has a premium, durable, linen feel when you pick it up, making the very process of learning the game an opulent, sensuous experience. On top of that the theme, while seemingly a quixotic one for today’s market (one exception can be found here), lends itself to the eye-catching avian illustrations of Natalie Rojas, Ana Maria Martinez Jaramillo, and Beth Sobel, whose work contribute to the essence of the game as much or more than anything I’ve played since Mysterium. This opulence is further accentuated by the over-the-top move to feature a unique bird/illustration on all of the 170 cards in the game. This isn’t Terraforming Mars with its huge quantity undermined by bargain-bin clip-art and it’s not Everdell where each lavish piece of artwork is reused multiple times. No, Wingspan is perhaps the most ambitiously-produced game I have ever seen. Anticipation for Wingspan (and I say “anticipation” despite it being officially released already) has reached a fever pitch, with a recent New York Times article on the game only serving to stoke the flames of a community already frothing at the mouth to get ahold of it. Indeed so much has already been written, so much adulation leveled at the game, that it’s hard to find anything to say that hasn’t already been said, but let’s give it a shot anyways. Wingspan is a conceptually-straightforward game. Each player receives a personal playboard made up of three rows of empty spaces (representing your three habitats). Players spend resource cubes on actions (gathering food, laying eggs, and drawing new birds from a central supply) on their player board which also doubles as their aviary with each row (that also represent your different actions) being gradually filled in as you add more birds to it. So the first of your key decisions in the game becomes how you fill in your aviary. Each bird in a given habitat increases the potency of the corresponding action. At the start of the game, your “gather food” action allows you to draw a single food from the available supply (determined by the food dice). Place a bird, though, and then that action will gather a food and allow you to discard a bird card from your hand for an additional food. Fill that habitat and suddenly the action gives you a whopping three food plus the option to discard for a fourth. And all three habitats give similar benefits. 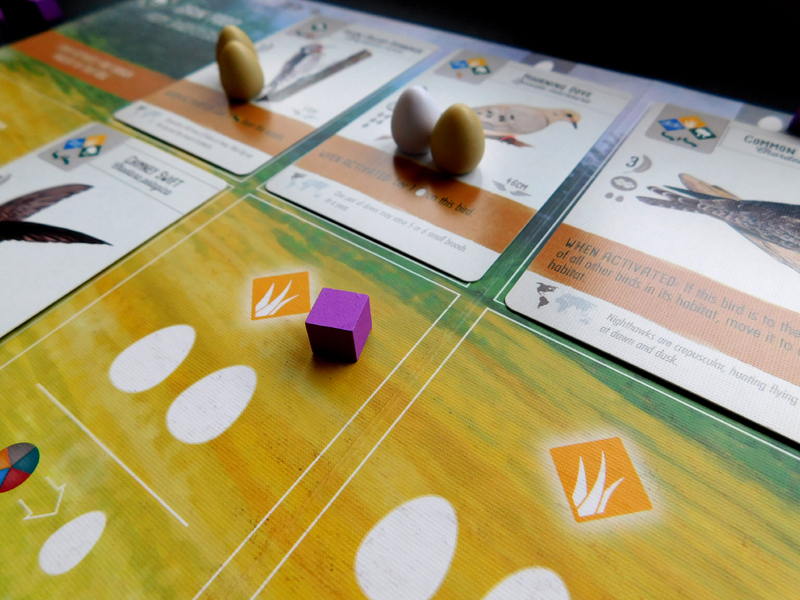 The grassland action allows you to place eggs on your birds (based on their nest capacity) and the more you advance it the more eggs you’ll place. Meanwhile the wetlands enables you to draw more cards. So you have food, eggs, and birds, all of which intertwine with each other and none of which are expendable. So do you rush your card-drawing only to be left with no food to play them? Do you pop out eggs like a vending machine only to realize you don’t have enough nests to place them? Or do you advance your powers equitably only to realize another player has leapt ahead of you? The answer is… well, it depends. The crux of the game—and the answer to that question—lays in the deck of birds at the heart of the game. Like your development in Terraforming Mars, your titular gizmos in Gizmos, and your spice trading in Century: Spice Road, the bird cards in Wingspan all provide abilities and bonuses, triggering at different times, that will be the ultimate key to maximizing the efficiency of your aviary. (Efficiency here meaning anything that will score you points, which is almost everything: birds, eggs, habitats, etc). While every bird in the game in unique, Elizabeth Hargrave went above-and-beyond in terms of scientific accuracy, with various birds having abilities and actions that mimic their real life habits and behaviors. As such, you will quickly see behavioral patterns emerge. You may not know which predators are in the deck, but you quickly realize that predators often trigger based on what smaller birds other players draw. So while you may feel like you’re being thrown in the deep-end without a life-jacket, the game quickly proves more intuitive than many of similar predecessors thanks to its theme. Unfortunately, Wingspan also shares the same flaw as many of those games, namely that your gameplay is almost entirely reactive and becomes difficult to plan. Based on the number of predators available early, you may steer towards them, expecting the gambit to pay off when a flock of smaller birds inevitably turns up. But it’s not as inevitable as you might think, and if those birds never show up (a frequent occurrence in the games I’ve played) then you’ve unintentionally hamstrung yourself through no fault of your own. Luckily, Wingspan provides such a cornucopia of scoring that, while a failed gambit will usually lead to defeat, you can never quite count yourself out. If your birds’ abilities aren’t triggering, then make them pay off by filling their nests with eggs! If eggs aren’t working out but you have an abundance of food, then target the high-cost birds that give huge amounts of points at the end of the game. Some birds will store food, which translates to points. 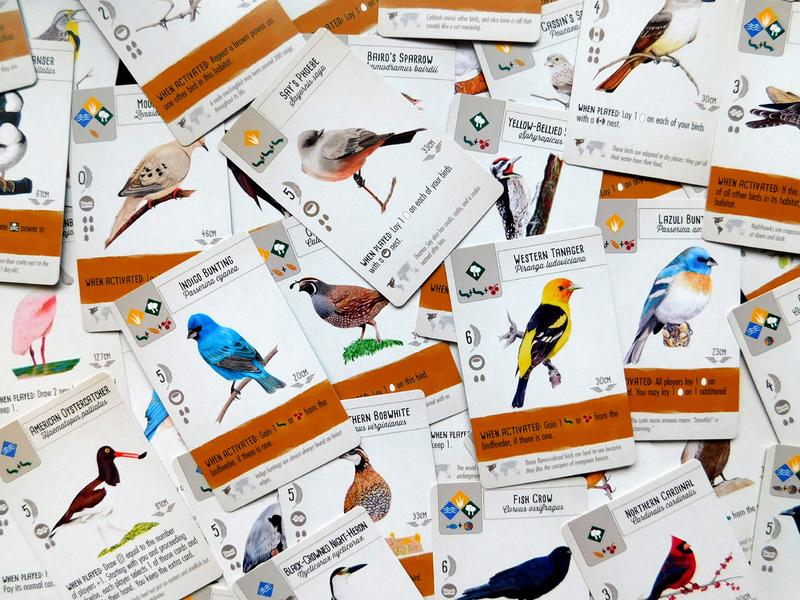 Others cache bird cards behind them which, you guessed it, scores points. It’s a buffet that’s both liberating and, at times, confoundingly broad. If you like to have an internal point-counter and try to keep tabs on how you stack up to the other players through the course of a game then prepare to be disappointed. You will quickly lose track of whether you’re ahead or not, which will either frustrate you or, hopefully, liberate you to focus more wholly on your own play. 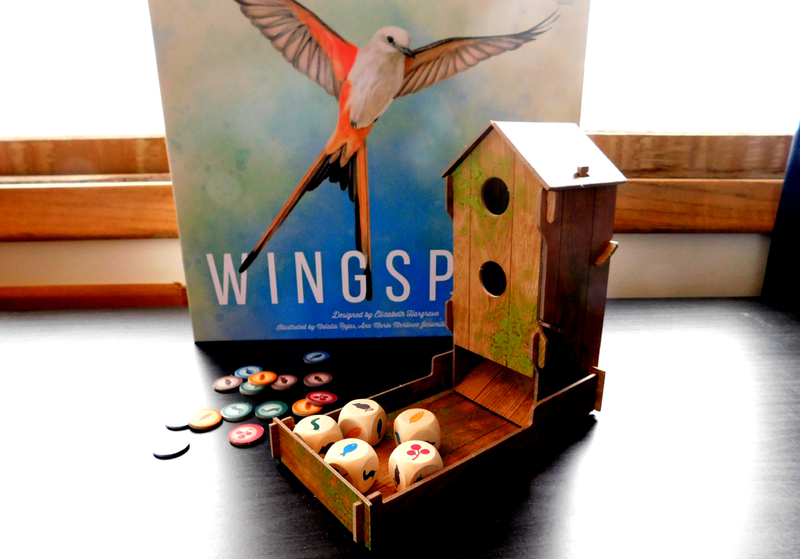 Ultimately, Wingspan feels very close to being a multiplayer solitaire game, a beautiful puzzle challenging players to maximize the potential of each game’s random carousel of birds. No two games will be the same, which means Wingspan isn’t a game you can master so much as a system or a language that you will gradually gain fluency in (which, tangentially, makes me extremely excited for the planned expansions, which will inject an exciting vocabulary boost into said language). 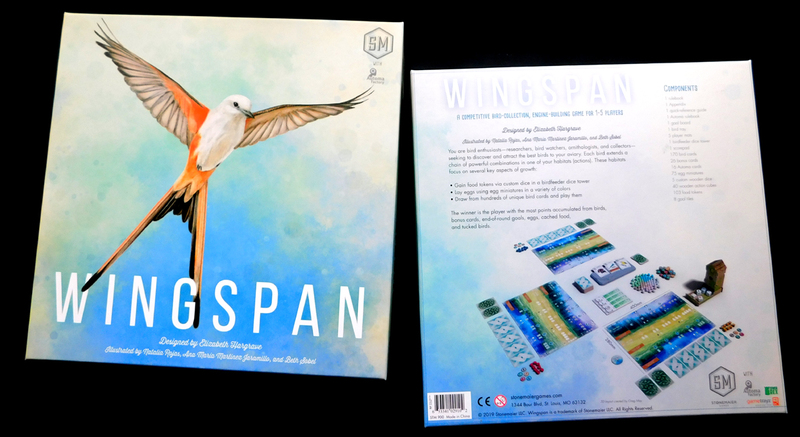 At the end of the day, here’s what you should know about Wingspan before you sell your house to try and find a copy: Wingspan is a lot like many things you’ve already played, but developed and produced with infinitely more love and care than those other games. Even the flavor text that provides individual, fascinating tidbits about the birds is better than most games (where, honestly, I usually skip the flavor) because not only is it factual, but that information can and will inform the way you play the game. The better you understand the birds, the better you’ll understand the game, and that’s a trick I don’t think most designers could recreate if they tried.